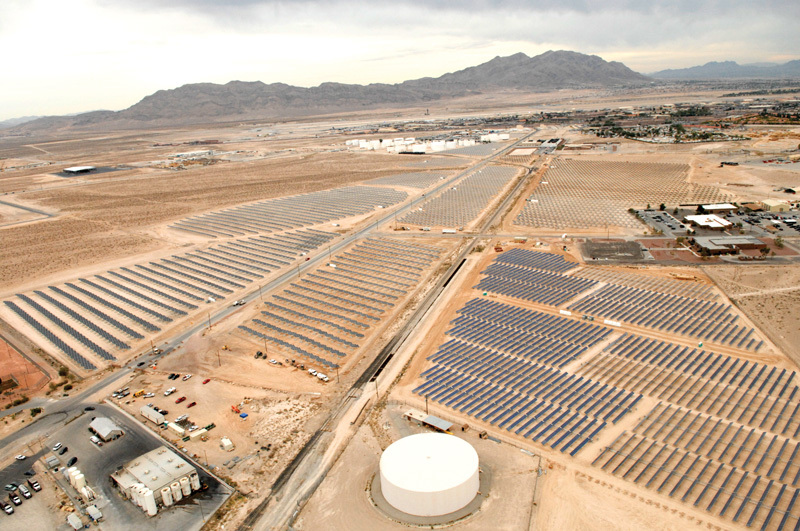 The largest PV solar power system in the United States-recently completed at the Nellis Air Force Base in Nevada-involved a new twist on typical power purchase agreements and land lease agreements for the system's owner, MMA Renewable Ventures. Not far from the glitz and glamour of Las Vegas is the Nellis Air Force Base, home to more squadrons than any other U.S. Air Force base. The 14,000-acre facility in the desert is also now host to another shining jewel-the Air Force's and the nation's largest photovoltaic system comprising some 72,416 solar panels. At 14 megawatts, the system generates enough electricity to meet about 25 percent of the needs of the base, which houses about 12,000 people. The Air Force leased 140 acres of land to San Francisco-based MMA Renewable Ventures LLC on which to build the PV system. MMA financed, owns and operates it under a 20-year contract. In return, the Air Force is able to purchase the electricity at a guaranteed fixed rate, saving the military base about $1 million annually. "This customer, probably more than any other customer, is very concerned as to where they get their power, from a security and clean environmental perspective," says Mark McLanahan, MMA senior vice-president of corporate development. The land lease and power purchase arrangements the Air Force made with MMA are not unusual, but they did involve putting a new twist on old vehicles. "This is a typical power purchase agreement," McLanahan says. "It's been used for decades in the U.S. as a mechanism for third-party financing of coal-fired plants. But it's a very new application for solar PV generation and distribution. We've used the same mechanism for many of our much smaller systems below 2 MW as well." As the project's owner and operator, MMA is able to take advantage of the 30 percent federal investment tax credit (ITC), something the Air Force couldn't do, McLanahan says. "The Air Force or other non-tax-paying entity would leave a lot of value on the table if they purchased it themselves, since they don't qualify for the 30 percent ITC," he says. Part of MMA's job was to create a pool of investors who could provide the $100 million needed for Nellis. One of the criteria is they had to have a collective tax bill of $30 million to take full advantage of the investment tax credits. "As soon as you break $50 million, you tend to tap into institutional capital that is available in the United States," McLanahan says. "The list of individual firms and investment houses in the United States that have that type of tax liability is relatively small. That's why we bring into our investment partnership groups like CitiBank that have tax bills reaching into the $1 billion per year range." MMA obtained financing commitments from Citi, Allstate and John Hancock Financial Services, with Merrill Lynch providing construction financing. Another part of MMA's job is to eliminate or mitigate risks associated with projects such as Nellis, McLanahan says. Possible risks include the project not generating the amount of electricity predicted and the payback not being as much as originally anticipated. MMA will receive the profits from the sale of the project's renewable energy credits to Las Vegas-based Nevada Power Co. Under renewable portfolio standards that the Nevada legislation passed in 1997, Nevada Power and its parent company, Sierra Pacific Power, are required to use renewable energy to generate minimum amounts of electricity. Beginning in 2001, the levels increase by two percent every two years until it reaches 15 percent by 2013. The Legislature revised that in 2005, to three percent every two years with a goal of 20 percent by 2015. The revisions also allowed utilities to meet the standards through renewable energy credits and energy savings from efficiency measures. Of that electricity, five percent must be generated, acquired or saved from solar systems. One kilowatt hour of electricity represents one portfolio energy credit, or PEC, except for that generated by photovoltaics, for which 2.4 PECs are credited for 1 kWh of energy produced. And it's the legislation-and an inquiry by a developer who was interested in using Nellis land for a PV array-that prompted the Air Force to begin thinking about a solar-generation project in 2004, says Capt. Jessica Martin with the Nellis public affairs office. "After learning of the developing renewable energy credits market in Nevada, we did a preliminary economic analysis and determined there was potential for an economically viable project," she says. Initially, the plan called for Nevada Power to solicit for RECs, and three developers responded with proposals to develop a system on Nellis land. The Air Force told Nevada Power that it would wait until the utility selected a developer and would negotiate with the chosen company. In 2006, Nevada Power told the Air Force it was still interested in buying RECs from a Nellis project, but the utility would leave it up to the Air Force to choose a developer. The Air Force quickly drafted a solicitation plan, which marked the beginning of the procurement effort, Martin says. The fact that the Air Force would not own the PV system helped expedite the process and meant headquarters didn't have to approve the construction, Martin says. The base contracting officer has the authority to sign power purchase agreements. Since the lease agreement was for 20 years, the secretary of the Air Force had to approve it. Nellis staff worked closely with the secretary's real estate office, resulting in a procurement cycle, from strategy development to award, of only 141 days. Typically, Martin says, projects of this scale would take one to two years for the procurement process. Three companies submitted proposals, and Martin says the Air Force chose San Jose, California-based SunPower Corp. for several reasons. "The proposals were first evaluated for technical acceptability-performance plan, financial health, management plan, etc.," she says. "Those found technically acceptable moved on to the price phase. The award was made to the technically acceptable proposal offering the lowest price over the 20-year lease period." The Air Force left the design up to SunPower, but figured the electricity pricing structure would prompt the firm to develop a system that provided the most "bang for the buck," Martin says. Nellis is not the largest project SunPower has developed, says Howard Wenger, SunPower senior vice-president. The 23 MW La Magascona plant in Trujillo and 21 MW plant in the Castilla la Mancha region of Spain both top the Air Force project. With more than 150 MW of solar power plants completed or under construction worldwide, SunPower applied its experience to the Nellis project. "We engineer our technology to maximize energy output and minimize installation time, and we often establish temporary manufacturing facilities near a site to further reduce costs of transporting materials and time to market," Wenger says. "That was certainly the model we used at Nellis." The project consists of 72,416 PV panels mounted on 5,821 single-axis SunPower Trackers. The panels follow the sun during the day and generate up to 30 percent more electricity than fixed-tilt ground systems. Due to the project's size, several manufacturers supplied the panels-SunPower Corp., Sanyo, SunTech Power Holdings and Evergreen Solar Inc. The SunPower panels are rated between 200 and 230 watts apiece, while the others are rated between 175 and 200 watts each. Altogether, 54 inverters from Xantrex Technology Inc. and 18 transformers were installed. The project took about 26 weeks to complete, beginning in June 2007. Because of the project's size, work was completed in phases. The first third of the PV arrays were connected in October 2007 after first being tested, analyzed and fine-tuned to optimize their performance. The Air Force dedicated the completed system in December 2007. 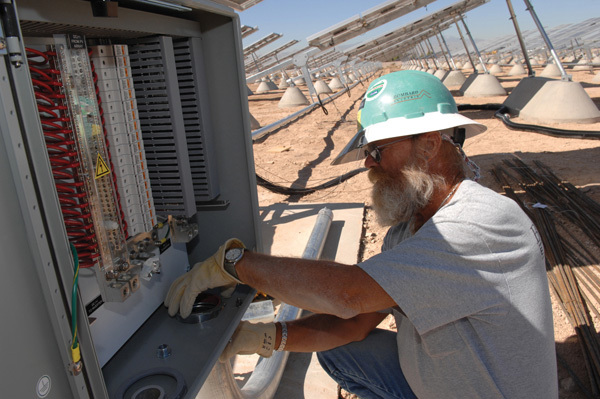 The solar-generation system is not connected to the grid and feeds directly into the base's power distribution system. And so far, the system is performing better than expected, Martin says. Although the Air Force had been interested in renewable energy projects for some time, few economically viable projects had been proposed before this, Martin says. The Air Force has a small PV system at Grassmere range, Idaho, that's been operational for more than 10 years. There is also a PV rooftop system at Luke Air Force Base, Arizona. 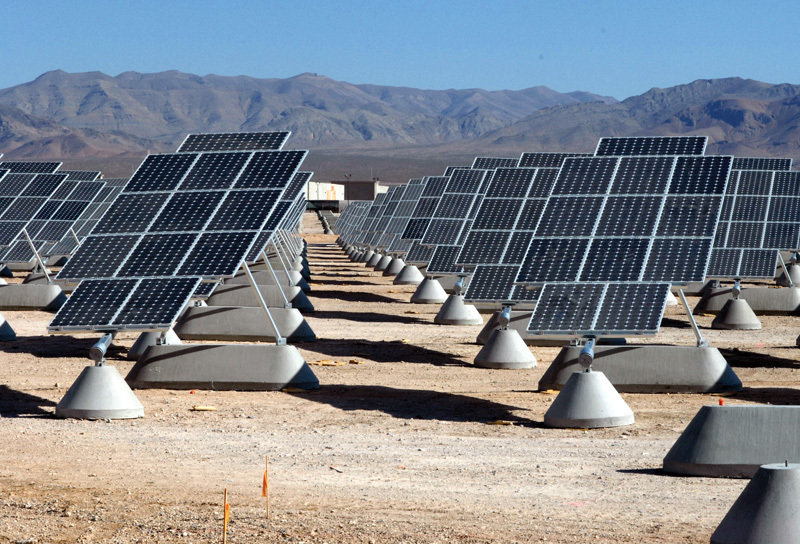 And the Air Force has issued a request for interest in a PV project at Davis-Monthan Air Force Base, Arizona. But she says the Air Force doesn't have any plans to expand the Nellis system since the REC market is pretty well saturated for larger-scale projects. Nevada Power and Sierra Pacific Power both have contracted to purchase enough portfolio energy credits to meet their solar portfolio requirements through 2014 and their non-solar portfolio requirements through 2024.